What on earth has landed on our dinner table? No, it’s not an alien invasion; it’s the beginning of rambutan season. 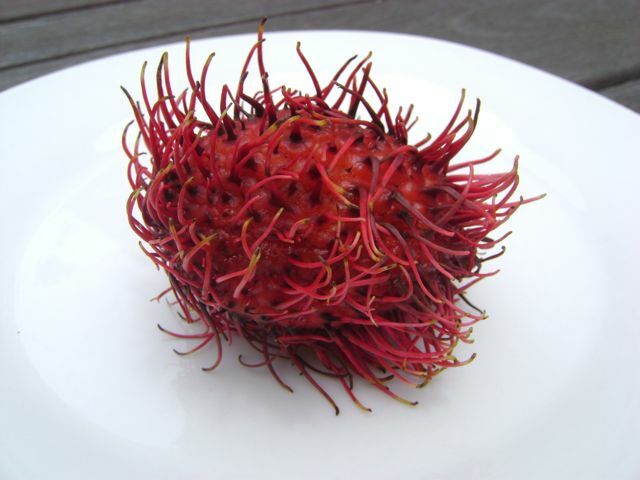 The rambutan (also known as “hairy cherry”) is a beautiful, otherworldly tropical fruit that could scare off just about anyone who didn’t know what sweet pleasures lie beneath its bristly exterior. The taste of the soft white flesh is closest to a grape, but with rich tropical overtones. According to Frieda’s, the specialty produce company who generously sent us a big box of rambutans, these little fruits are grown in clusters on trees in tropical climates such as Guatemala, Honduras, Mexico, and Costa Rica. They can come in either red or yellow, with red being the more common variety. To prepare the rambutan for eating, pry open the shell or score it with a paring knife, and then pop out the juicy white fruit. The fleshy white orb surrounds a seed that you don’t want to eat, so you can either nibble around the seed or cut it out entirely. We think the best way to eat rambutans is to put them on the table and let everyone explore their taste and texture. 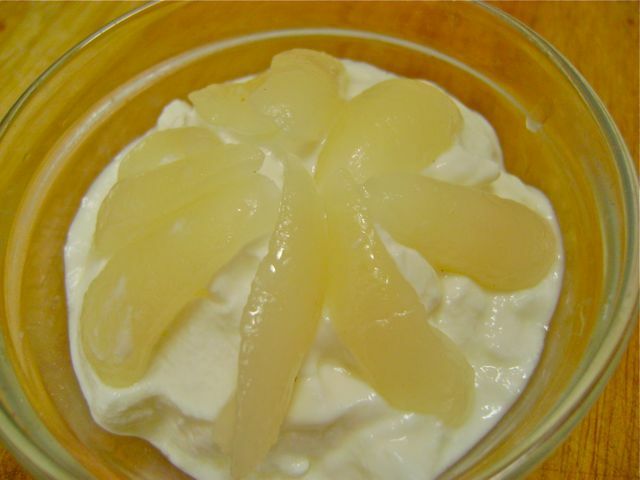 But if you want to make it a little more of a special event, serve chopped and pitted rambutan on top of yogurt or ice cream for a tropical summer treat. Divide lettuce among four plates. 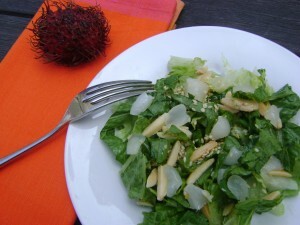 Sprinkle with rambutan, almond, and sesame seeds. In a small bowl, whisk together sesame oil, lime juice, and honey. Drizzle over each salad plate. Serves four. Rambutans are available at Ralphs Select and Ralphs Fresh Fare stores, or by special request from the produce manager. They are also available through August directly from Frieda’s. Jolly Tomato’s Fun Food: Because food should be fun. Interesting. I didn’t know what this fruit was. Thanks for educating me! 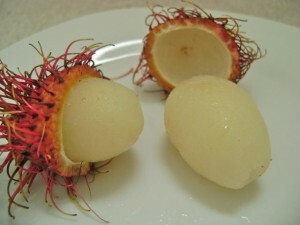 looks like lychee? Hi Amee! Yeah, it’s probably closest to the lychee – but a lot hairier! Don’t let the hair turn you off, though. It’s very tasty. Thanks for stopping by! 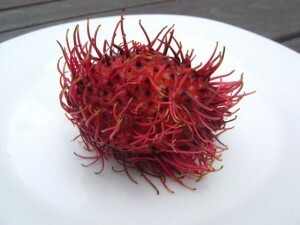 Ralphs in Hollywood will have Rambutan in store tomorrow, and a few others!